Who Guarantee that I get my money back if I am not fully satisfied with my purchase? I do! Nanhai Marine Archaeology Sdn. Bhd. and myself are absolutely confident that you will like whatever you purchase from us. All artifacts sold are recovered by ourselves so there is no question about provenance. Our Certificate of Authenticity which is delivered with every piece with a serial number confirms the type of artifact, its serial number, proper age and from which shipwreck it arrives. This is our Guarantee that the object you order is an genuine historical artifact. In addition to this you should visit our Museum Collections page and get a second opinion from any of the listed museums about us and the provenance we provide. If you need further third party assurances, visit our "What Others Say" page. Here you will be assured that you are dealing with professional people and legally excavated artefacts which are provided with a Malaysian National Museum -Export Licence, should this be required. Sten spent more than thirty years in Southeast Asia, primarily designing and engineering marine structures. Sten has an academics enthusiasm for ancient ceramics and has written numbers of books and lectured extensively in the subject. 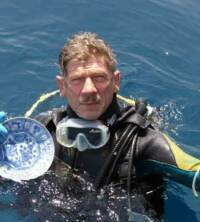 An champion sailor and diver he has discovered a number of shipwreck in the South China Sea and assisted museums world-wide to exhibit and to collect meaningful ceramic collections. Sten has located number of ancient kiln sites in Thailand and in China were his shipwreck ceramics was made centuries ago. Thereby able to offer absolute provenance on all ceramics sold via Nanhai Marine Archaeology Sdn. Bhd. If you are not satisfied with our artifacts, delivery service or; if you obtain an expert opinion that the artefact is not of the age stated by us, just return it and we will give you full refund!